I love days like these, when the words flow freely from my fingertips, when the rain silences the outside sounds, the world pulled back into its cocoon for a bit, cold weather coming, rain here now, when I could sit for hours and just describe for you the squirrels scuttling down the hackberry tree, finding shelter, the pale golden reflection of the lamp behind me in the glass doors, the absolutely perfect position I am sitting in to type, slouched at just the right angle, pure comfort, I have been here for a while, fingers making few mistakes, knowing their places on the keys. I am hurrying against the clock, late for work, writing all morning; when it comes, you have to let it come, not stopper it up, but I am hurrying it, hurrying it, thinking it will not be finished until tonight, thinking I cannot possibly get through it this morning, knowing I need to step out into that rain and find a picture, thinking it will be Katie's blue lights, they being something I also love, knowing I cannot marry the picture to words until later, always later, later in my life, but the joy of the words finding their way is now, and I love these moments, a love equal to many other loves in my life, the losing of myself quite pleasant. Like so many loves, the losing of myself and the finding of myself at the same time. Ecstasy. Being lost in the moment makes for some very interesting photos and musings. 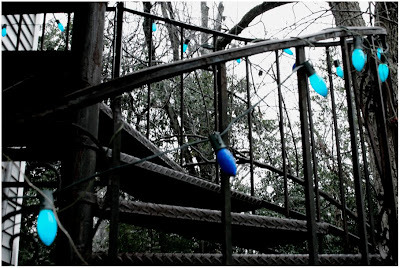 love katie's lights ..will the texas sun shine soon? So perfect to be totally lost in the moment of self-expression. Beautiful!!! Yup....gotta love it when everything flows freely! I'm enjoying your "love" series! finding and losing yourself all at the same time....me too...often... and it feels good ! You are fluid. Here, but moving to there, your words following you like a stream. I wish the words flowed for me like they flow for you. Words are such a struggle most days. BUT, the days where they do come easily and I get lost in the words are ecstasy - I couldn't agree more. I was recently having a conversation about "getting lost" with my husband and how I enjoy "finding myself" in the end....Great expression D.